This must surely be the strangest movie that Audrey Hepburn made, though it’s not without its virtues. Directed by her-then husband, actor Mel Ferrer, the 1959 movie is a fanciful adventure story where Hepburn plays Rima, a nymph-like “bird girl” living in the remotest part of the Venezuelan jungle. She is being hunted by the local Indian tribesmen for being an evil spirit, but she is protected first by her grandfather Nuflo and then by Abel, a young political refugee whom she rescues after he is bitten by a deadly coral snake. The slowly-paced story initially focuses on Abel’s hazardous journey into the jungle with Joseph Ruttenberg’s cinematography nicely capturing the authentic Amazon locations. Rima shows up as a shadowy figure about a half-hour into the film and doesn’t speak until about ten minutes later. Leave it to Hepburn to exhibit any sort of conviction in such an impossible role. Looking ethereal if a little too styled and coiffed (even without Givenchy) and sounding entirely too Euro-cosmopolitan, she still exudes Rima’s innocence while discovering the darker secrets of her past. The rest of the cast is not as lucky. Anthony Perkins, a year away from “Psycho”, is irritatingly unctuous as Abel when he is not simply confounded by his heroic role. His low point has to be the ridiculous scene when he sings a love song to Rima as he strums his guitar. And where exactly did the guitar come from? Familiar character actors show up in the oddest roles. Lee J. Cobb, heavily made up as a cross between Uncle Jesse Duke and Santa Claus, turns in yet another ham-fisted performance as Nuflo, and Henry Silva is cast as another exotic as the ultimately nefarious tribal leader. Nehemiah Persoff has a small bit at the beginning as a greedy trader, while Sessue Hayakawa, of all people, has a mostly silent role as the tribal leader. Adding to the artifice is the obvious use of soundstages and matte shots to replicate the jungle, and the ending is pure Hollywood sappiness. 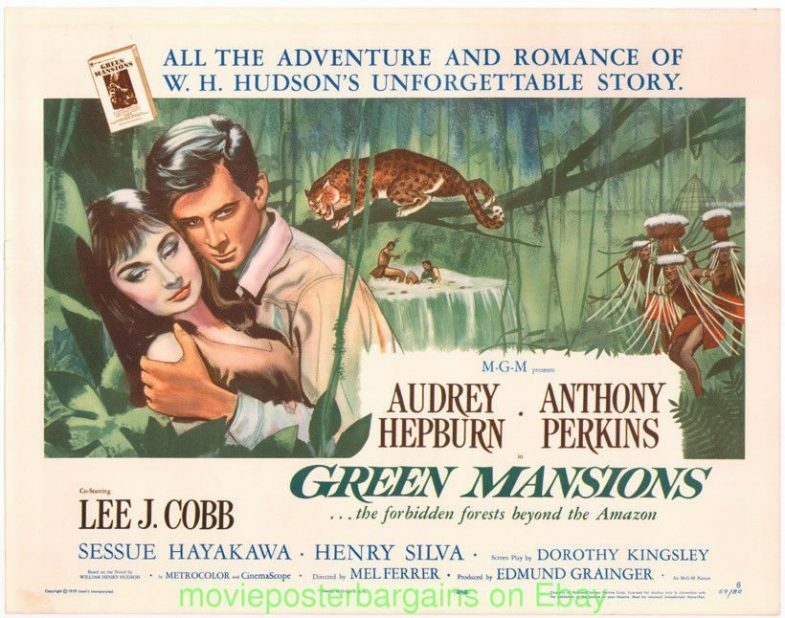 This is a curio for Hepburn fans. 19 out of 25 found this helpful. Was this review helpful? Sign in to vote. I guess there’s some difference of opinion as to what is found in the area that headwaters of the Amazon and Orinoco Rivers make their neighborhood. Arthur Conan Doyle wrote that there was a lost world of prehistoric dinosaurs when he wasn’t doing Sherlock Holmes stories. But W.H, Hudson has us believe that there’s a young waif like girl making her home with her granddad among all the hunter/gatherer tribes of the area. At the time that both The Lost World and Green Mansions were written that area was still one of the few unexplored parts of our globe. I daresay that there are still some parts of that area that haven’t seen the trod of civilized feet ever. But it sure makes for stories of imagination and in the case of Green Mansions, romance.